Federation University Australia > About us > Our university > Our history > Geoffrey Blainey Research Centre > Honour Roll > CAMPBELL, Charles E.
Born at Ballarat, son of Edward E. Campbell, one of Ballarat's early settlers, Charles was educated at Macarthur Street State School and Grenville College. He entered SMB as a photography student in 1896, attained a Pass at Grade 1 level that year, and completed his Grade 2 photography studies (with a Pass) before graduating in 1897. In 1915, SMB temporarily discontinued its photography class 'owing to the pressing need for economy at the beginning of the year.' Other classes to be discontinued during this period included blacksmithing, pattern-making, sheet metal working and sign-writing. However, the photography class was re-opened before year's end under the lectureship of Charles Campbell in the New Art School Building. This decision was fully justified in view of the number of students attending the class, according to SMB's 1915 Annual Report. From 1901-1903 Charles Campbell held a commission in the 3rd Battalion Infantry, Ballarat. In 1910, he partnered F.S.B. Wilson in the establishment of the firm Campbell, Wilson Pty Ltd, photo engravers and commercial artists. This business operated from premises situated in the London Bank Chambers, Ballarat - meanwhile, Campbell continued to conduct the photography lectures at SMB. Campbell resigned as lecturer in photography in 1918. According to SMB's 1918 Annual Report he was succeeded by Norman Wood. Charles Campbell's father, Edward was an early Ballarat settler who successfully established himself in business as a printer and bookbinder. His firm also offered a photo engraving service. Trading under the name E.E. 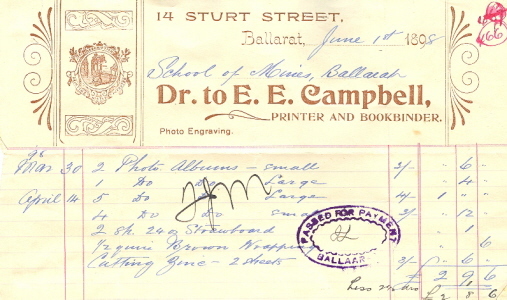 Campbell from premises located at 14 Sturt Street, Ballarat, it supplied photographic and printing materials to SMB and its students for many years.